Edward R. Dewey, who worked for US President Hoover in the 1930s was a pioneer in the discovery of natures cycles. They affect business, the markets, and so much more. In the Great Depression, President Herbert Hoover asked Edward Dewey, who at the time was the Chief Economic Analyst at the Department of Commerce, to figure out why the US continually experienced economic booms and busts. In the 1800s and early 1900s, there were eight economic downturns of varying degrees. Dewey devoted the rest of his life to uncovering and understanding cycles. During his lifetime, he established over 3000 cycles in nature and business. He found that the Canadian Lynx followed an abundance pattern of exactly 9.6 years. For over two hundred years, they’ve prospered and then died off in a regular rhythm. The coyote, red fox, fisher, marten, wolf, mink, and skunk have the same abundance patterns. The chinch bug, which frequents much of the US Midwest, has a similar pattern—at its height swelling to as much as 70 million per acre down to just 1600 per square foot at the bottom. 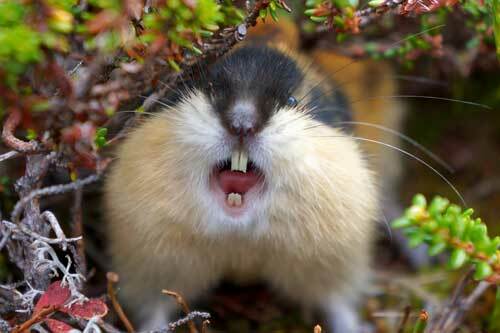 The lemming, that little six inch rodent found in Norway, has a 3.86 year life pattern. Every 3.86 years, they come down from the hills, destroy everything in site, don’t stop when they get to the sea. .. and end up drowning. A few who remain behind for some unknown reason start up the next herd which, right on schedule, heads to the sea all over again. These cycles are apparent in every living thing. Just as the Moon travelling around the Earth every 25 hours affects the ocean in a 12.5 hour cycle (the tide), our circadian rhythms are also influenced by the Moon. Research has proven this to be the case (eg – the work of Rutger Weaver and his underground bunker experiments). Now, you may want to argue about the fact that we’re influenced from beyond the confines of the Earth (which I find to be an exceptionally weak position), but it’s hard to argue with human nature. We continue along a path of habit, until a shock to the system causes us to reverse course. You can equate this with a law in physics: a body will continue along a path until acted upon by an external force. To reverse the direction will require a force larger than the force that created the motion in the first place. Humans don’t change their views until acted upon by an overwhelming outside force or, which is more often the case, gradually changing their mind based upon a growing change in the thinking of the herd around them. Herds don’t change their thinking in a day. As an example, review the gradual trend change in smoking habits that I wrote about in March of this year. It also played out in five waves; trends always do. The higher the volume of participants, usually, the easier it is to track the underlying waves. Back to those crazy lemmings: They don’t die till every bit of food is gone and they’re at the ocean. Similarly, the herd isn’t going to change until they’re up against a brick wall. If things are working, they keep doing the same thing. Taxi drivers in Chicago. There’s an interesting article in zerohedge this morning about taxi drivers in Chicago. With the rise of Uber and other rideshare companies, the value of “medallions” driver purchase to allow them licensed access has plummeted. This has been going on for several years and small business owners are going bankrupt, but nobody is really doing anything about the problem. They probably won’t, until it’s too late. That’s human nature (and the track record of governments, always the “last ones in”). It’s human nature to abhor change. We don’t do it until we’re forced, generally. 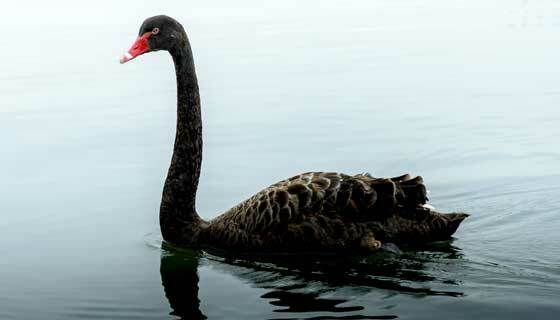 I want to address Black Swan events, because people keep talking about them, expecting them to somehow affect the stock market, although they never have before. I would agree that there are financial black swan events, but they don’t affect the stock market to any great degree. I’ve shown this is posts about varies events that have had huge impacts on society here. Events such as 9/11, President Kennedy’s assassination, or Brexit (and any other major social, political, or financial event) have not had an appreciable impact on the stock market. Various assets or indices may react within a small period of time, but the current pattern plays out; the overall trend does not change. People point to October 19, 1987 as Black Monday … a financial black swan event in the stock market. But it wasn’t; it was highly predictable, as it was an Elliott Wave fourth wave playing out, as the two charts below illustrate. Crashes aren’t really crashes. Above is daily chart of the SP500 from July, 1985 through December 30, 1987. You can see the end of the five wave build-up to the top at about 340 and then the “abc” drop to the previous fourth wave. From an Elliott wave perspective, there is nothing black swanish about this at all. It was highly predictable. Fourth waves in an impulsive sequence revert back to the previous fourth in a corrective wave, before they turn back up again to rejoin the trend. Above is a daily chart of the SP500 from June 20, 1987 through December 30, 1987 (a much tighter timeframe). You can see how the October 19 “crash” is part of a C wave that was already about half-wawy through its projected path. The gap shown was the overnight progress, but the point is that the entire pattern is one that plays over and over again in an Elliott wave sequence at various degrees of trend, because progress is fractal. The “crash” was simply a continuation of a C wave. Elliott waves are an guide and tracking system for the mood of the financial herd. The market will keep tracking upwards until all the events along the way turn the positive herd negative. It isn’t going to happen in a day. There will not be any single event that creates the turn. However, there may be a financial event close-by that will be blamed for the turn, even though the turn has already happened. The market will continue along its journey of churning out the same patterns over and over again, progressing through all the required waves as it always has been, until the positive mood of the crown has been whittled away to nothing. At that point, the fifth way will finish, and the market will turn down. Sometime during the third wave (or C wave, as the case may be), the pundits will call a crash, even though the market turned a long time ago and the progress downward has been predicted to the day by EW analysis who can read waves and understand fibonacci measurements. You can’t stop this process before it’s played out to its natural end. Any one event will not do it. As with lemmings, we won’t be able to point to any one day in which they’ll all die out. It will take 3.86 years for the process to play out. There will be a day when 50% of the original population has died. And there will be a day when none of the lemmings sitting at the ocean’s edge are dead. However, nothing will stop the progress. As long as they’re hungry and feeling good, they’ll continue on with their journey, eating everything in site. Not one of them will confer with the others and collectively decide that if they move along this road, disaster is eventually going to strike. It might occur to a few of the smarter ones, but by and large, the herd will move along their path until they can’t move any more. So the market moves towards the eventual trend reversal with its bullish and bearish waves along the way. Elliott waves give us the predictable guide as to when these subwaves might happen. Knowing what wave or pattern we’re in and knowing that since we began to track the market (in the 1700s), these waves have always played out in the same manner, we can have a very good idea of where we are in the process. Nobody can know exactly when the herd will turn 51% negative. But it’s at about that point that the market will change trend. Sometime later, the herd-watchers will catch on and start blaming any event they can on the turn. But just like the progress of lemmings to the sea, it was bound to happen. The more astute of us can see it happening. And the herd will make sure it does, just as it always has before. Let’s let nature play on, and admit that Mother Nature’s far more powerful than the collective human race.